The former blog started wîth our visiting Proto-Renaisance and Gohic churches. 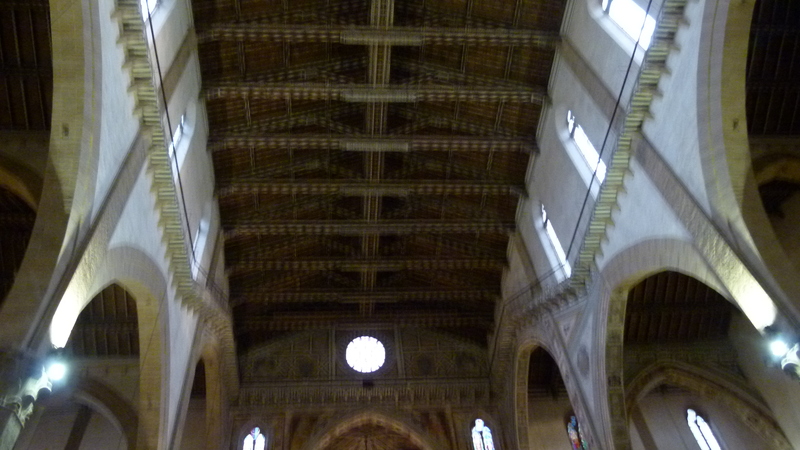 Let me now continue with some more Gothic churches of Florence. 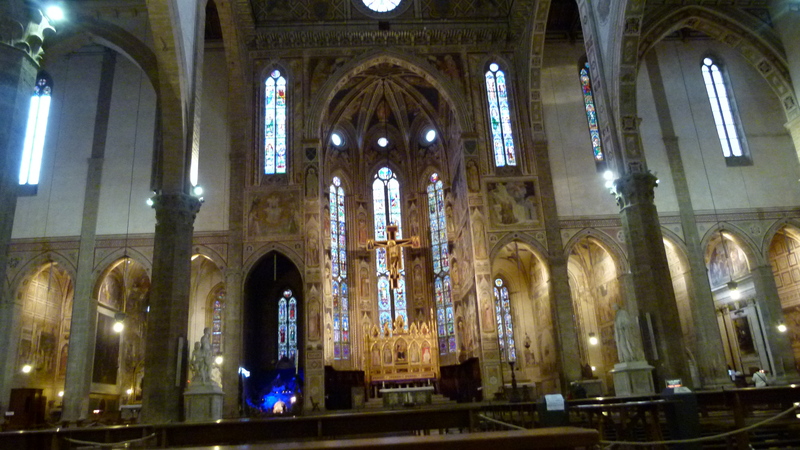 Orsanmichele was built around 1340. The oratorium or church is gothic, with harmonious blue ogives. 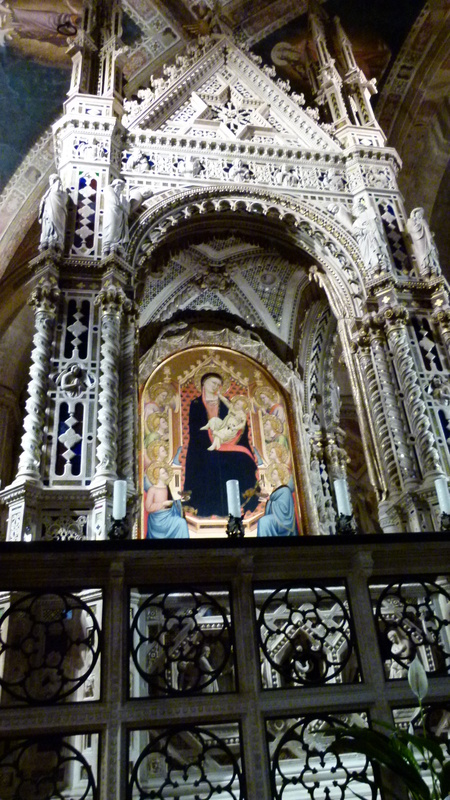 Center piece is Maria with the child painted by Bernardo Daddi and sitting in the tabernacle shaped by Oracagna. There was a market here before. A Maria painting was adorning the market and it was said to have performed miracles. Daddi’s Maria replaced the original and the church was built for it. Above the church were grain stores. 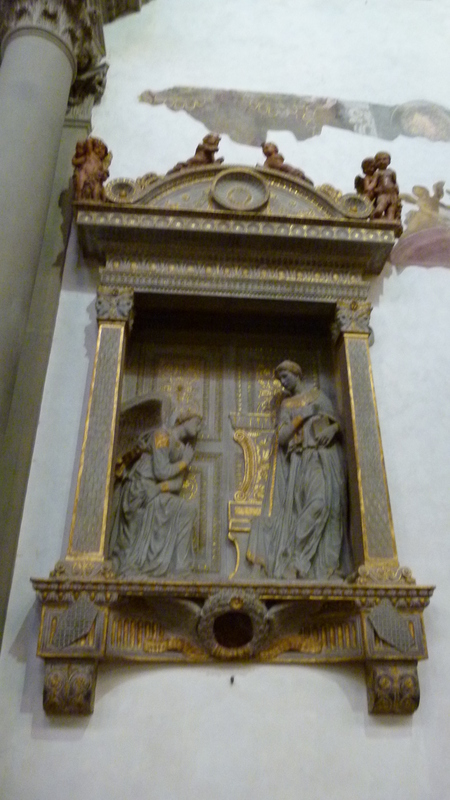 Orsanmichele belonged to the guilds of Florence. The guilds ordered statues for the niches around their building. The originals are now in the museum above the church (where the guilds had stored their grain before). 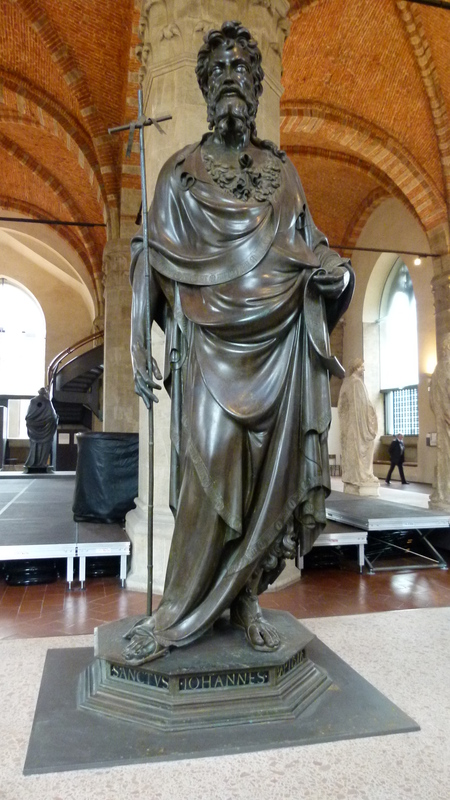 Here is one example: St. John the Baptist by Ghiberti. I now start to recognize St. John, as he always carries this stick with him. There are 14 statues by Ghiberti, Donatello, Nanni di Banco and others, all from the 15th century – pure elegant Renaissance. While strolling through Oltrarno on our first day in Florence, Leni and I come across the church Santa Maria del Carmine that is currently closed. 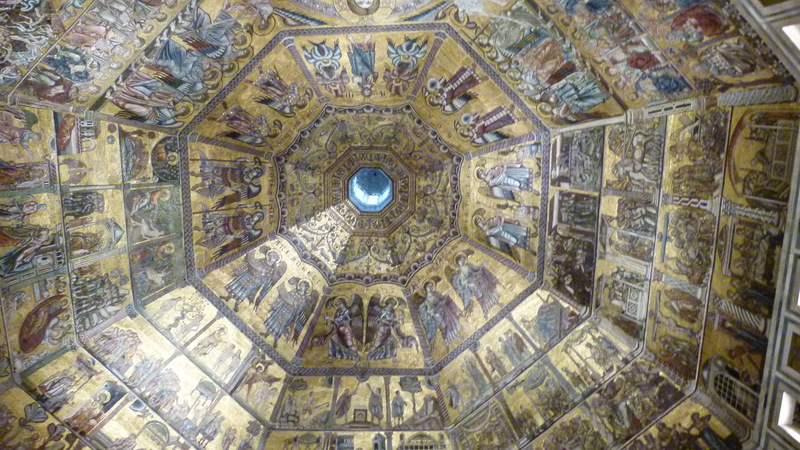 A group of students from the Alsace are buying tickets for the attached Brancacci Chapel and we join them. 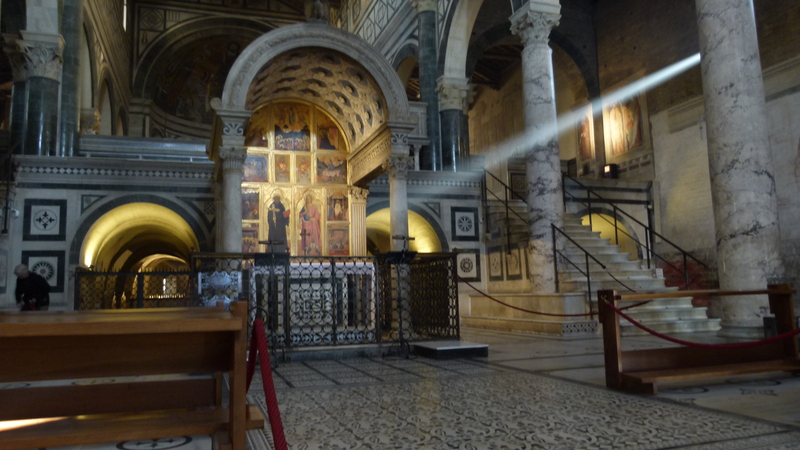 THIS chapel is THE treasure of Santa Maria del Carmine. We sit between the students that start to copy the frescos on paper. The master piece is Massaccio’s “Expulsion from the Paradise” that marks the transition from Gothic to Renaissance painting. The angel directs Adam and Eva to leave the paradise and the distress can be seen on their faces – it is a shock for them. 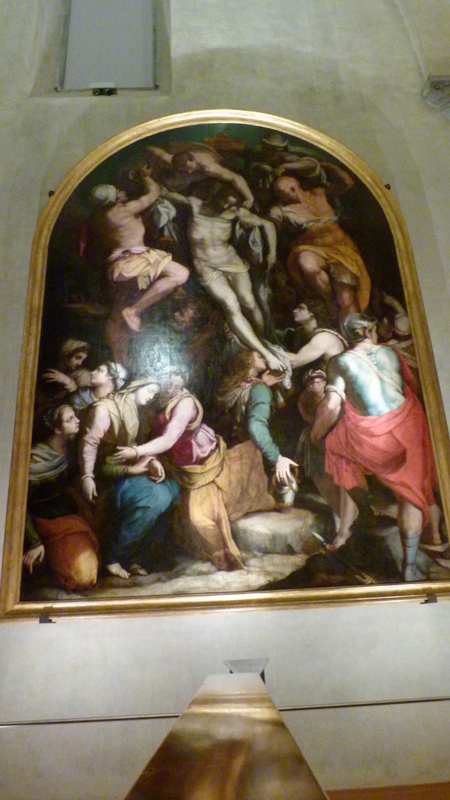 Massaccio is the artist that also painted the “Crucification” in Santa Maria Novella and that died at the age of 27. Opposed to that is the fresco of Masolino showing the “Tempation”. It is still clearly Gothic – Adam and Eva are far less natural than in Massaccios fresco. 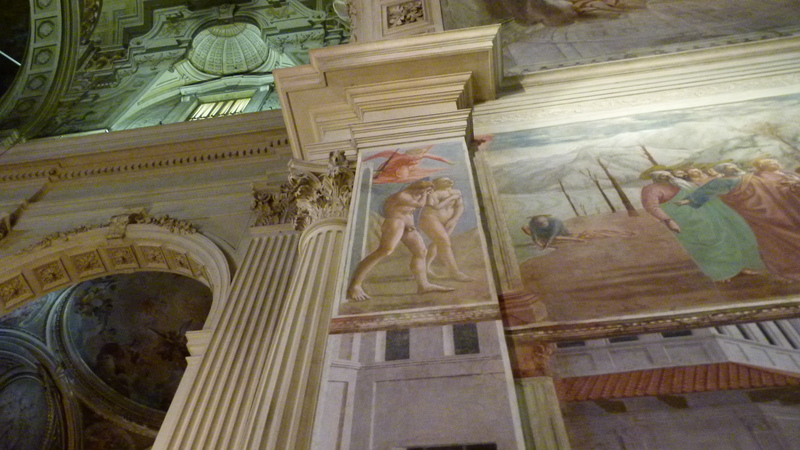 These two frescos made a great impression on me. Never before had I seen so clearly the difference between Gothic and Renaissance painting. It was Lippi who completed the gorgeous fresco cycle of this chapel. Our Dumont has a detailed legend of all stories. Interesting is the scene of tax paying: Christ asks Petrus to catch a fish who will carry a double drachme in his mouth, and Christ is right. Petrus catches the fish and they pay the double drachme needed. 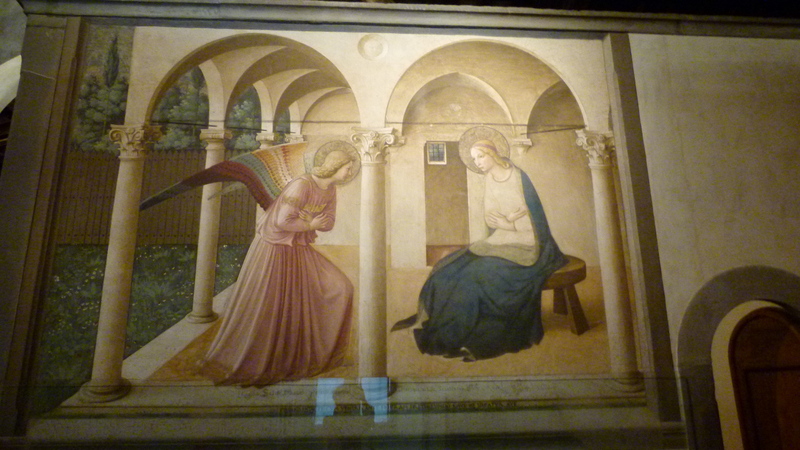 Fra Angelico was both a Domincan monk and an artist. Around 1440 he adorned the cells of his brethren with frescos that tell the story of Jesus. He adorned more than forty cells. The “Annunciation” welcomes us at the entrance. From the 40 plus frescos I select just two. 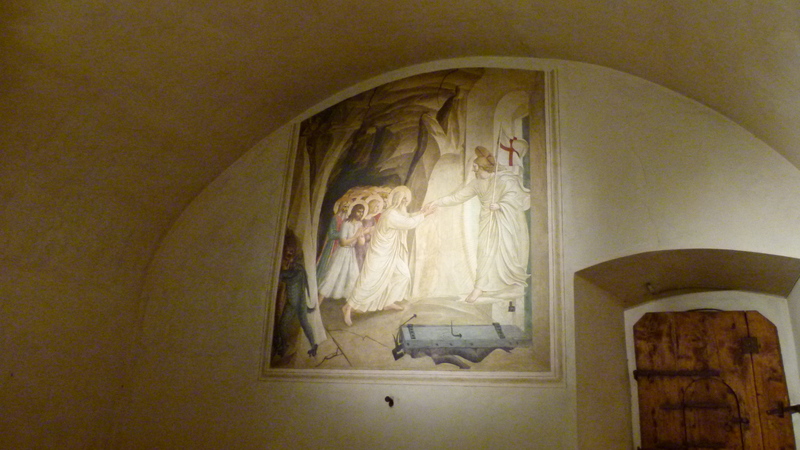 The first shows faithful people leaving the limbo towards Christ – while he devil is locked under the door to his hell, unable to move – I like the humor in this fresco. The second is an scene rarely painted: “the Mocking of Christ”. Fra Angelico symbolizes the mockers by painting a head with a speech balloon shouting at Christ. 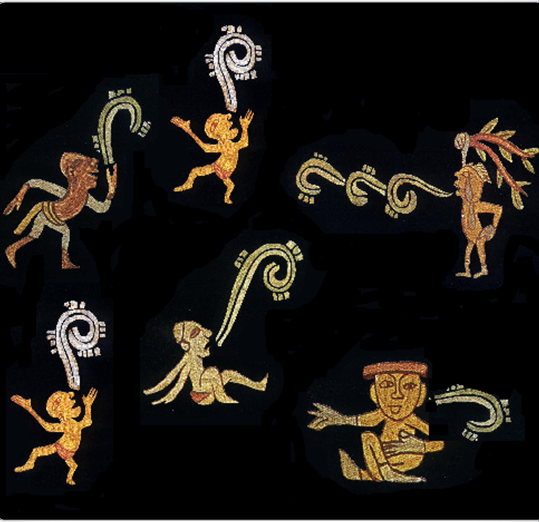 I remember such speech balloons from Mayan drawings and I am impressed that very different cultures use similar symbols to represent speech. 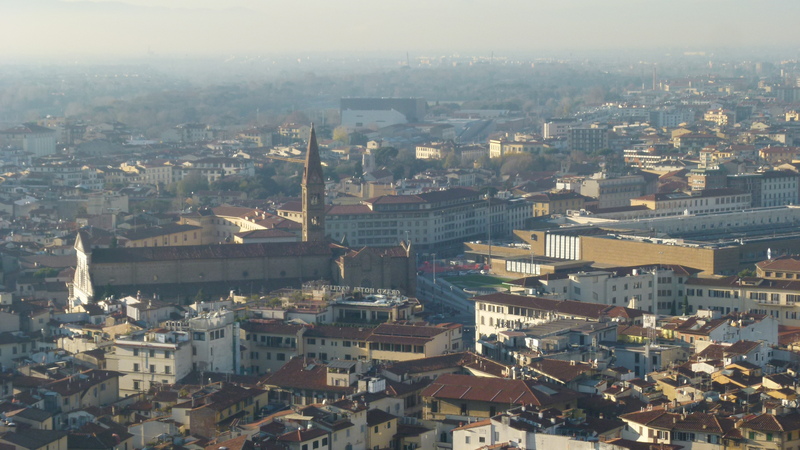 San Lorenzo is a clear landmark in the silhouette of Florence: The cupola of the Medici Chapel can be seen from far – the San Lorenzo church looks almost small next to it. San Lorenzo is the first Renaissance church in town and is based on the architetural principles of the former churches from Proto-Renaissance and Gothic, in particular the shape of a Basilica with 3 naves. A factor that appears again and again in the Renaissance architecture are “pietra serena” (grey sandstone) combined with white plaster. 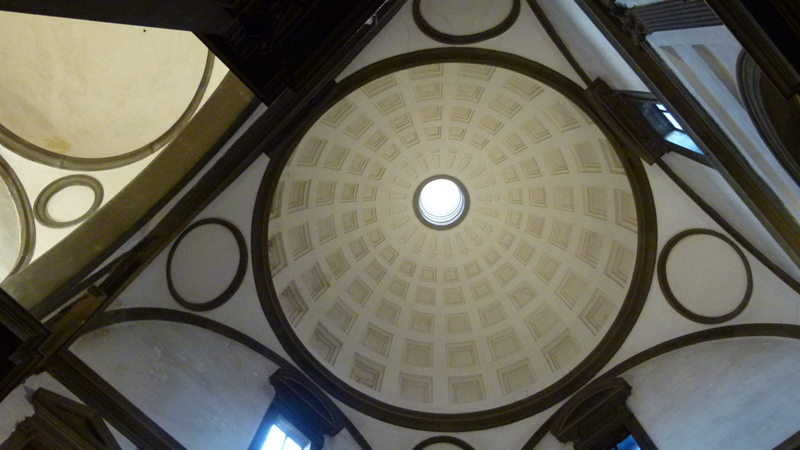 This shapes the naves of San Lorenzo, the Old Sacristy built by Brunelleschi and also the New Sacristy built by Michelangelo – here is the cupola of the New Sacristy. 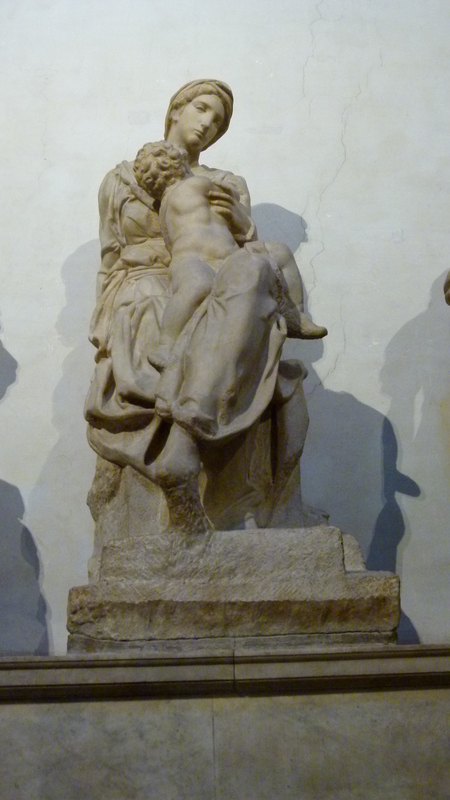 “Mother and child” is an incompleted sculpture by Michelangelo that stands at the backwall of the New Sacristy. The baroque Chapel has been built for the Medici in the 17th century, when they had become dukes. The Medici Chapel shows, how rich they are – the decoration is almost too much for me with all the marble tiles and precious inlays in pietra dura. 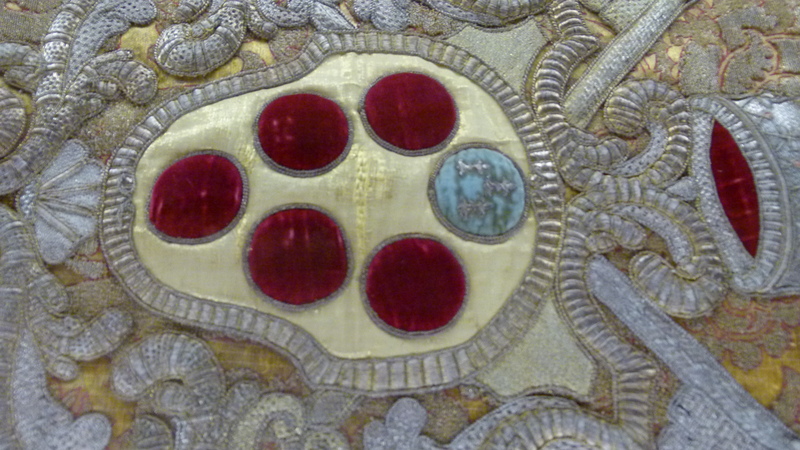 I like this ceremonial ribbon with silk embroideries that shows the family emblem of the Medici. 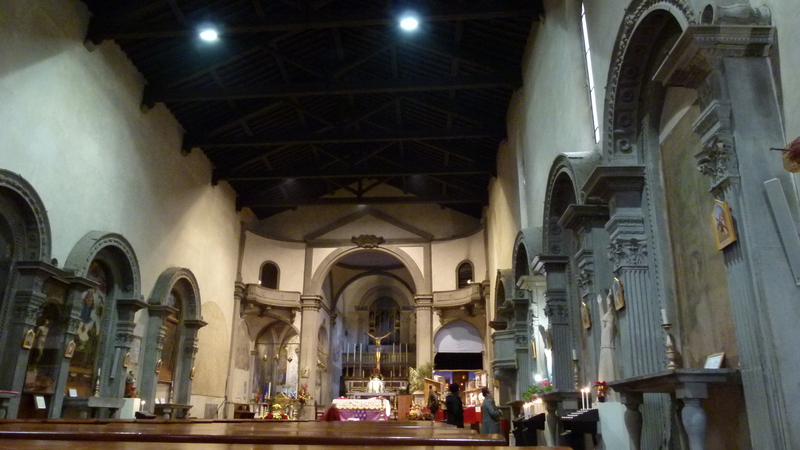 South of the Arno is the second Renaissance church that Brunelleschi has built. Inside are again three naves adorned with white plaster and pietra serena (or grey sandstone). They give harmony to the church. 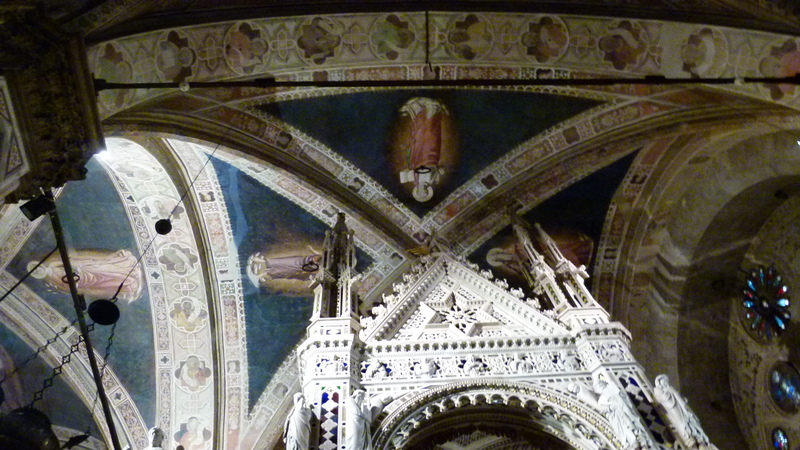 The Dumont complains that there is a Baroque altar in the middle interrupting the clear lines of the nave. 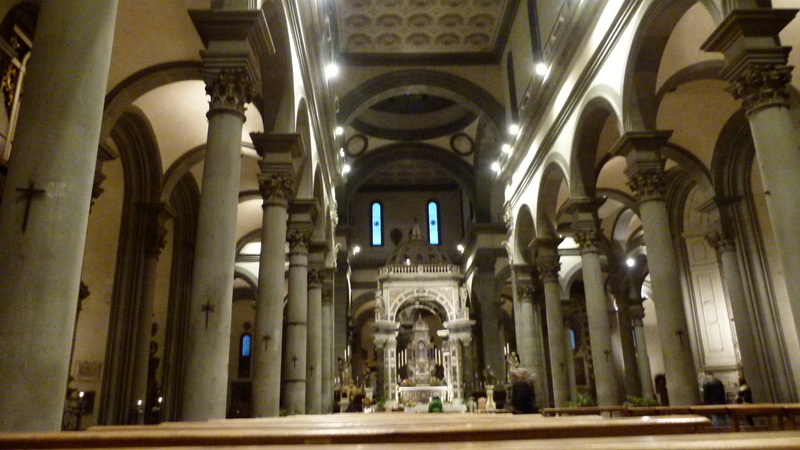 With Santo Spirito I end our virtual walk through the churches of Florence. The target of us three Swiss – Ursula, Leni and Petra – will next be museums and palaces. After having shared some impressions about Proto-Renaissance, I will now continue with some churches from Florentine Gothic. 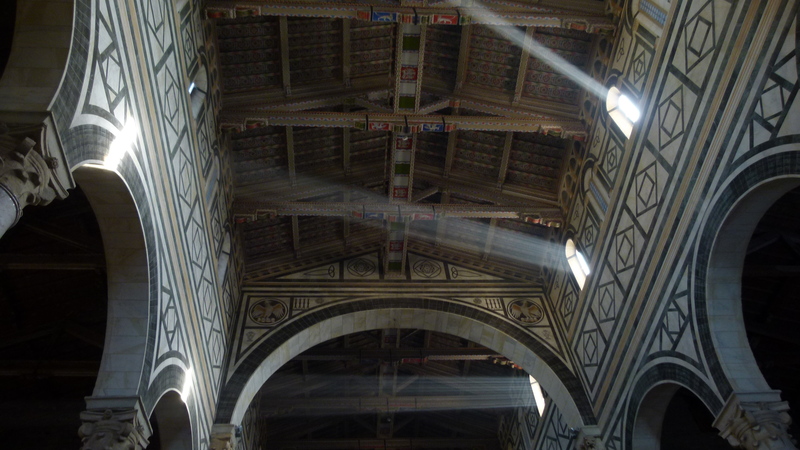 Santa Maria Novella is the first gothic church in Florence. The Dominicans started the construction in 1246. 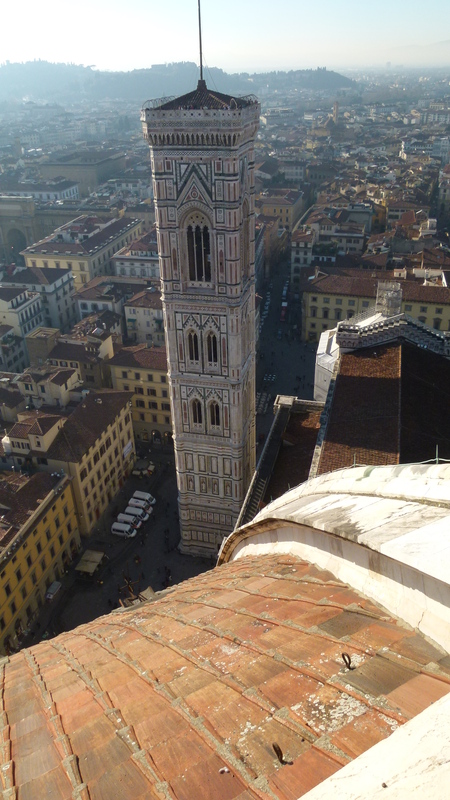 Here is a foto taken from the cupola of the Duomo. The railway station is just across. This is the nave. There are ogives, but less pronounced than in central Europe. 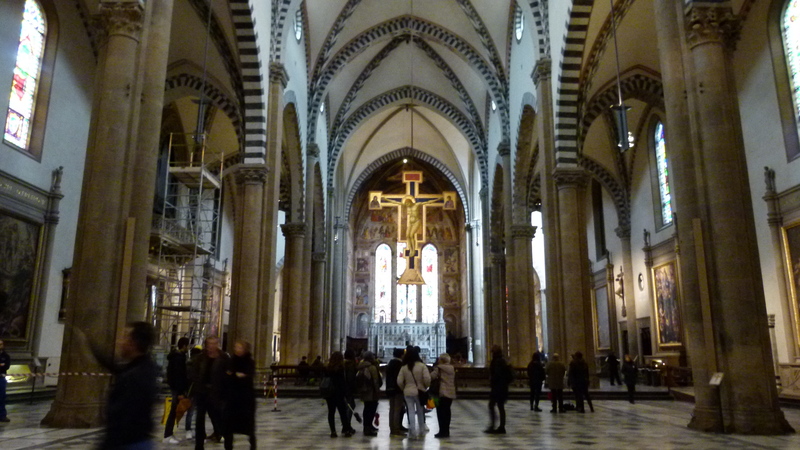 The wooden cross of Giotto (1290) is one of the highlights. 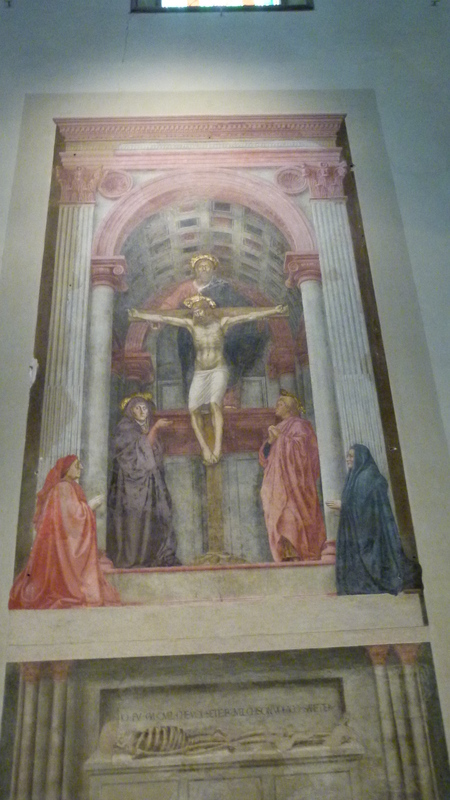 Masaccio was an outstanding artist at the transition between Gothic and Renaissance who died at the age of 27. His “Santa Trinitá” (ca 1428) is famous for the perspective that was innovative at that time and helped pave the way for Renaissance paintings. In the attached Spanish Chapel we come across the watchdogs of the Lord. They are black and white. I learn that “Dominicans” stands for “Canes Domini” or watchdogs of the Lord. 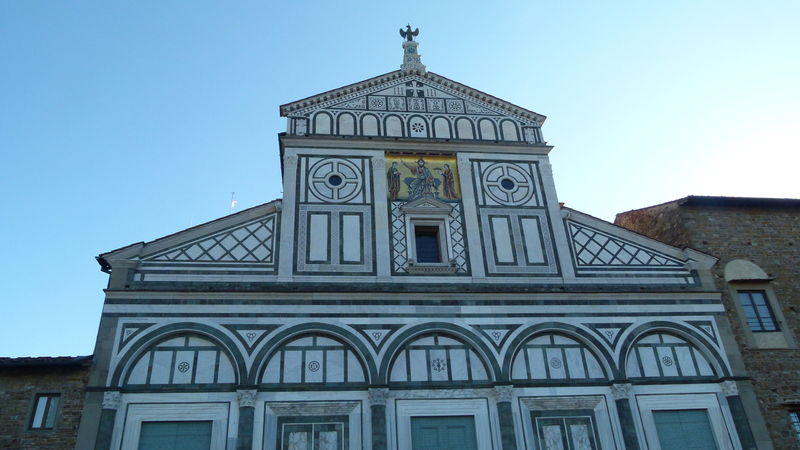 The Spanish Chapel tells the history of the Dominicans that have built Santa Maria Novella. Badia means “monastery” and today belongs to the Fratenernity of Jerusalem. We just visit the cloister with the view of the gothic Campanile. The nuns are inventive and sell unusual souvenirs. I buy soap made from the milk of donkeys and some honeydrops. Sant’Ambrogio is located east of the city center. Very easy to reach from our hotel near Santa Maria Novella: We just have to follow the streets aligned along the old Roman Decumanus. I like this church with its open roof framework and beautiful frescos such as the “Maria Lactans” by Orcagna. 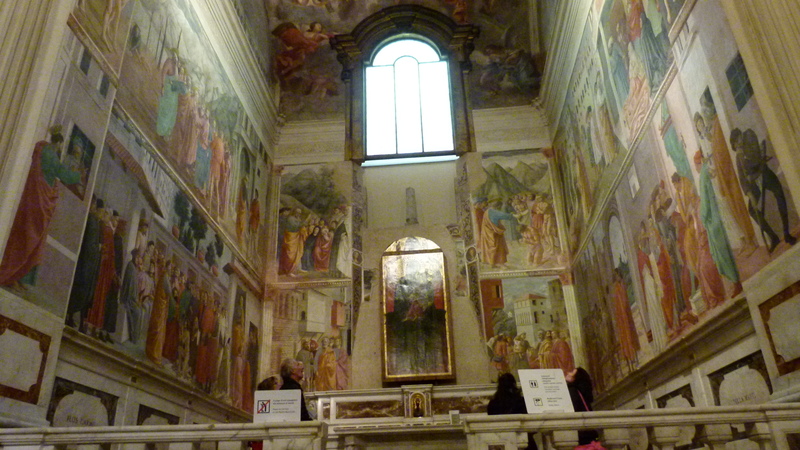 My fotos of the frescos are blurred, as the church is rather dark inside. The full name of the Duomo is “Santa Maria del Fiore” and this name is related to the lilly flower that is the symbol of Florence. We loved to come back to the Duomo again and again. The gothic construction plan was followed by the architects until the Cupola and the Lantern were completed in the 15th century. 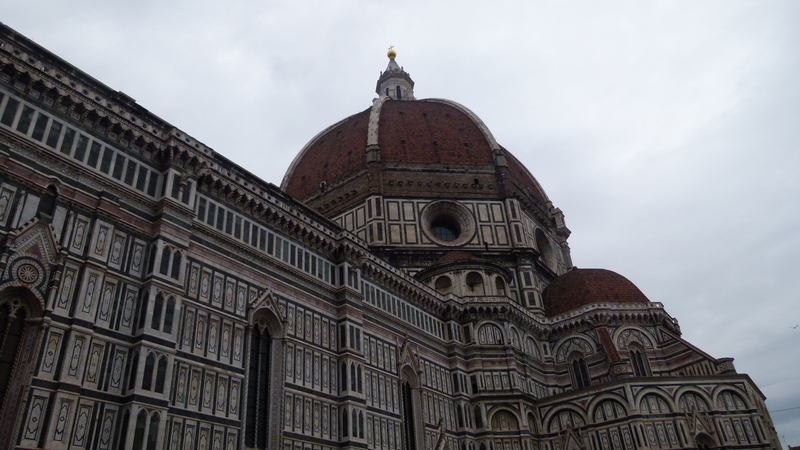 The names of the architects included Cambio (1296), Talenti (1350) and above all Brunelleschi who after 1418 was the genius implementing the cupola based on the original plans. His breakthrough was the idea to avoid using a huge scaffold from the ground, but a hanging scaffold that would grow with the cupola. He meticulously planned the construction and checked the progress every day. 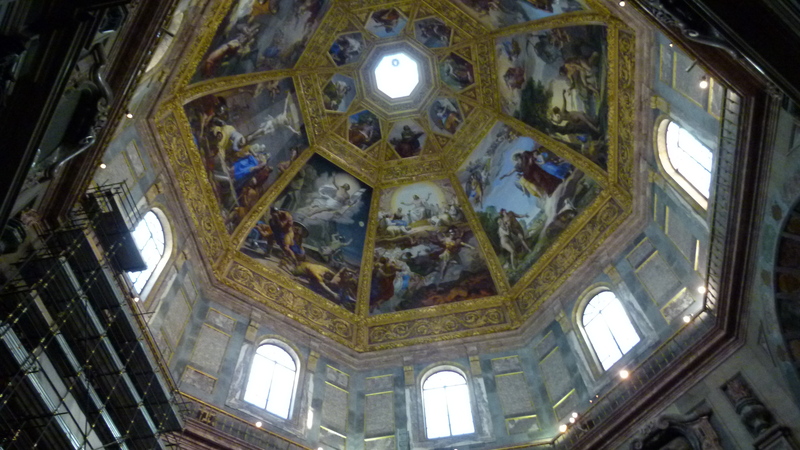 Vasari and his successor later completed the paintings in the cupola. 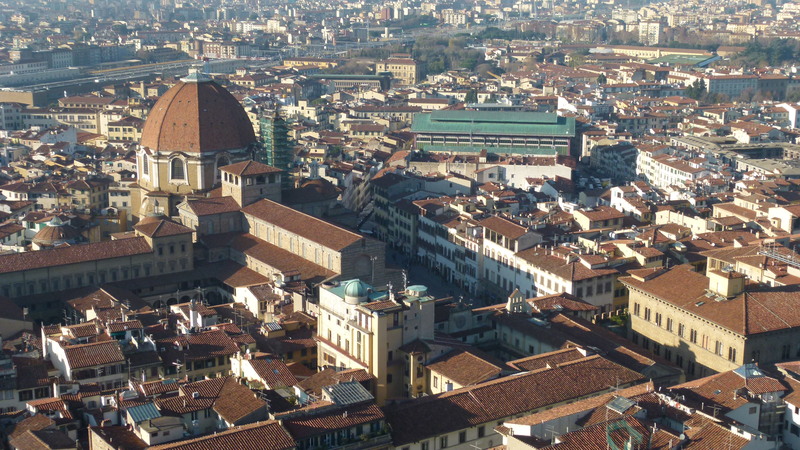 On a sunny day, I climbed Brunelleschi’s Cupola and enjoyed the magnificent view of the town. 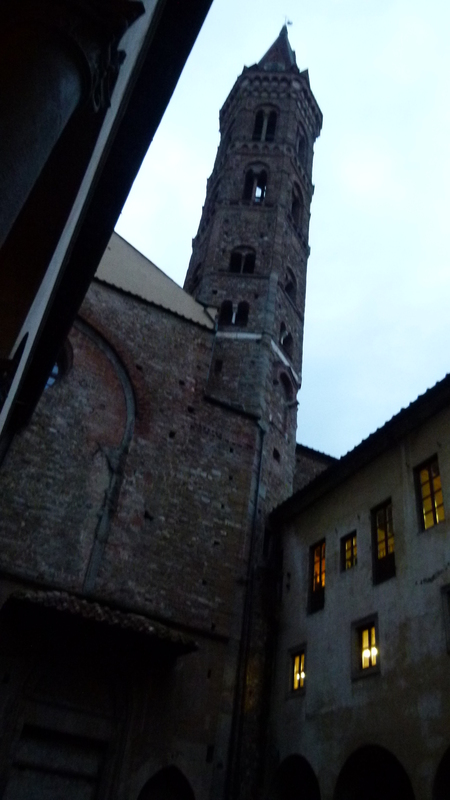 The Campanile (around 1340) was Giotto’s masterpiece that his successors completed, among them Andrea Pisano and Talenti. Santa Croce is the church of the Franciscans. Like San Miniato and Santa Maria Novella, the facade is adorned with white marble and grey Pietra serena, but this facade was completed only around 1860 – it is assumed that the facade is based on the orignal plans. The woodwork of the ceiling is open, reflecting the modesty of the Franciscans. The nave gives the impression of a uniform entity, as the woodwork of the central nave is repeated in the aisles and the floor tiles are also the same. Only the choir reminds a bit of central European Gothic. Beautiful chapels are on the side, with frescos from the first half of the 14th century (many by Giotto and his workshop). 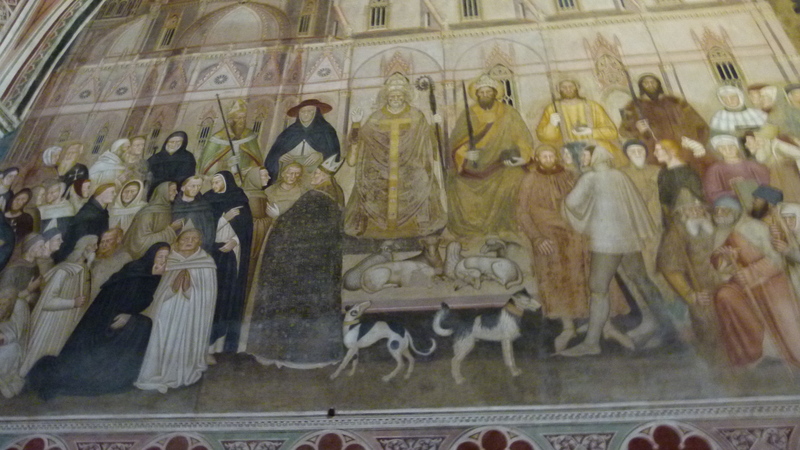 Santa Croce is rich of artwork. Leni loves this vivid painting of the “Deposition from the Cross” by Francesco Salviati. 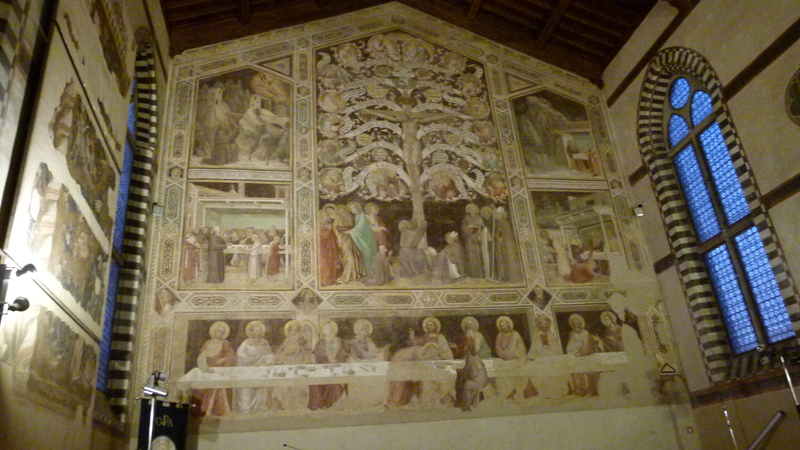 Leni and I spend so much time in the main church that we miss the attached Pazzi Chapel on our first visit. The guardian watching over Santa Croce feels sorry for us: “You HAVE to see the Pazzi Chapel”, he says, “you HAVE to come back”, and he writes on our ticket that we are allowed to enter a second time, adding his personal signature. Great that the guard working here loves his church. When we come back later, Ursula shows us her favorite artwork, Donatello’s “Annunciation”. 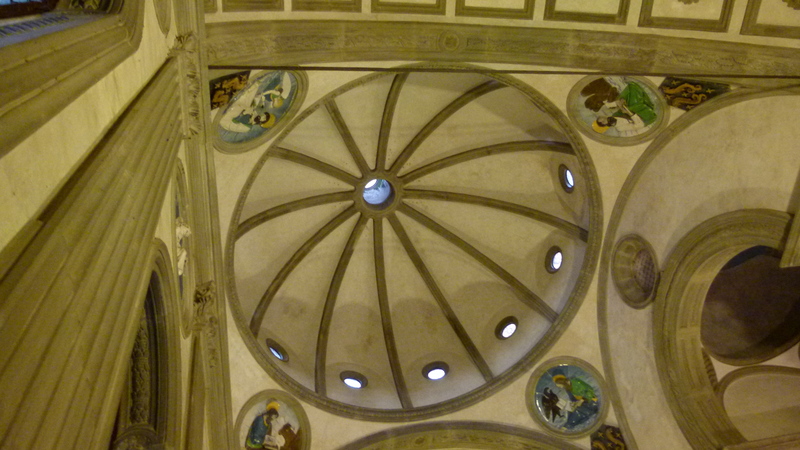 And we visit Brunelleschi’s Pazzi Chapel. The chapel was his last Renaissance master piece. We just sit inside and meditate in this unostentatious hall full of harmony. Later we enjoy the treasures in the attached museum. I particularly like the crucification on the tree that adorns the backwall of the former refectorium. Let me continue later with some more Gothic and with some Renaissance churches – again following the achitecture time line of Florence. 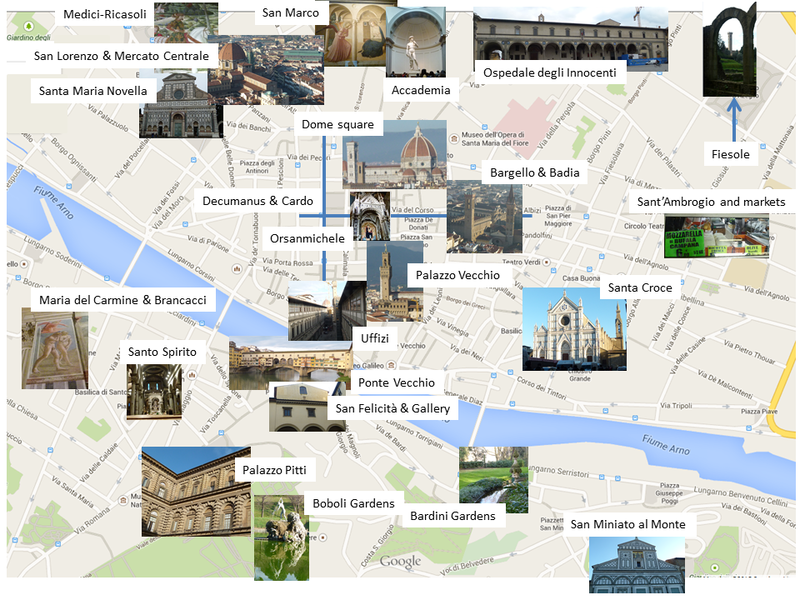 After having completed my simplified town map of Florence, I want to understand where the treasures of Florence fit into the architectural history. As I am not a professional historian – and hence I am just “trying” to get order into my head by aligning the churches and secular building from Proto-Renaissance to Baroque, primarily based on the Dumont Kunst-Reiseführer. When around 1000 AD Florence started to gain economic power, they built their first Romanesque churches. The period was called “Proto-Renaissance”, because the later Renaissance artists based their clean and harmonic architectural principles on it. I also sense that the gothic period is a smooth continuation of the Florentine Romanesque style – “Gothic” in Florence looks very different from “Gothic” known in central Europe. 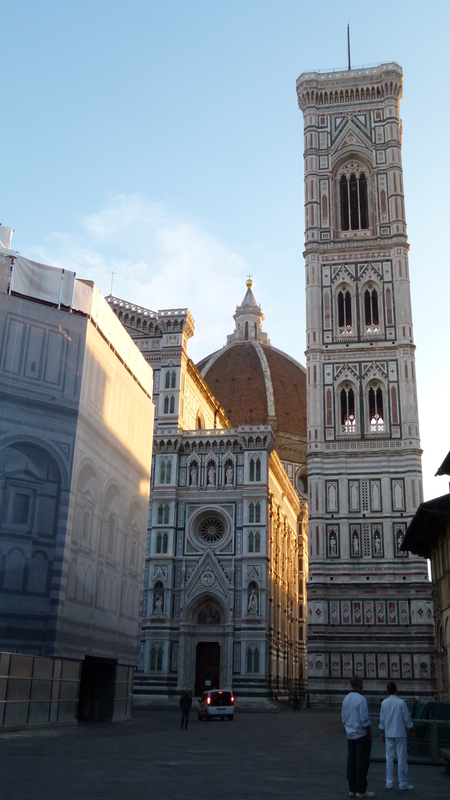 The main construction activities in Florence took place between 1250 and 1600 – from Gothic to Renaissance. I have a personal preference for the clean and unostentatious taste that prevailed before the 17 century started with its baroque “gold and glitter”. Minias – according to legend – was a martyr that was decapitated around 250 AD. At this place the construction of the monastery and church of San Miniato al Monte started around 1000 AD. 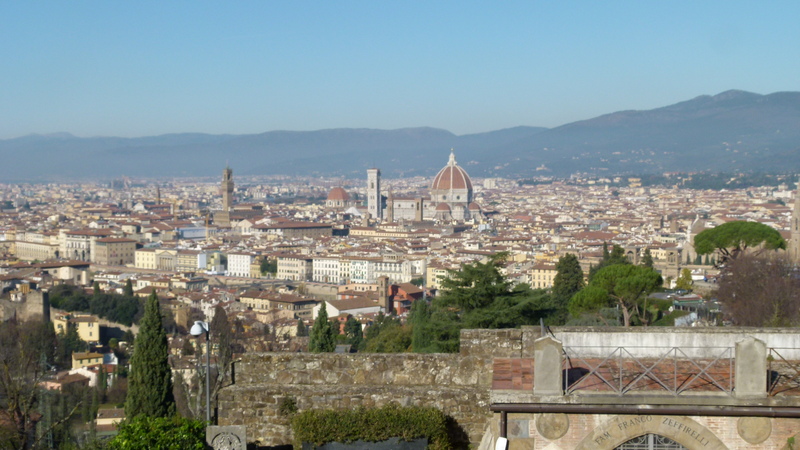 It took us about an hour to to reach San Miniato al Monte via Piazzolla Michelangelo. We enjoyed the view of the city with the Duomo, the Campanile, San Lorenzo and the Palazzo Vecchio. San Miniato welcomed us with the facade topped by the eagle of the woolmakers (who sponsored the church) and the mosaic completed around 1250. 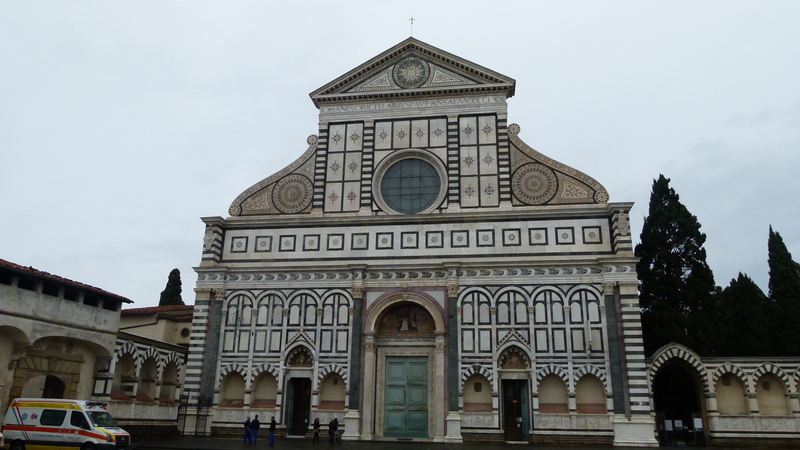 The patterns of this facade I recognize in the gothic churches Santa Maria Novella and Santa Croce and in the later Renaissance architecture. Inside the mass is going on solemnely enlighted by mystic sunrays. 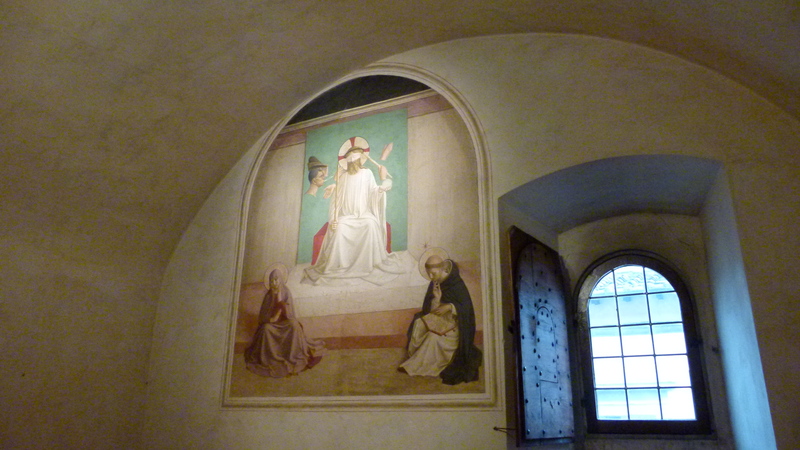 The rays point to the Ziborium of Michelozzo (1448) and the altar paintings of Agnolo Gaddi (around 1400). Seeing – looking – is it a dream? Seeing – amazing – is this true? I look and wonder, all in trance. For me it was like being reborn (“Renaissance”), when looking at the treasures of this Renaissance town and enjoying my eyesight. The sunrays also point to the wood framework that I find beautiful. Currently the Baptisterium, built around 1100, is under renovation and fully wrapped up. The Baptisterium is devoted to St. John the Baptist. Until the 19th century it was the only place in Florence where Christians were baptized. It stands close to the Duomo and the Campanile that were built later. 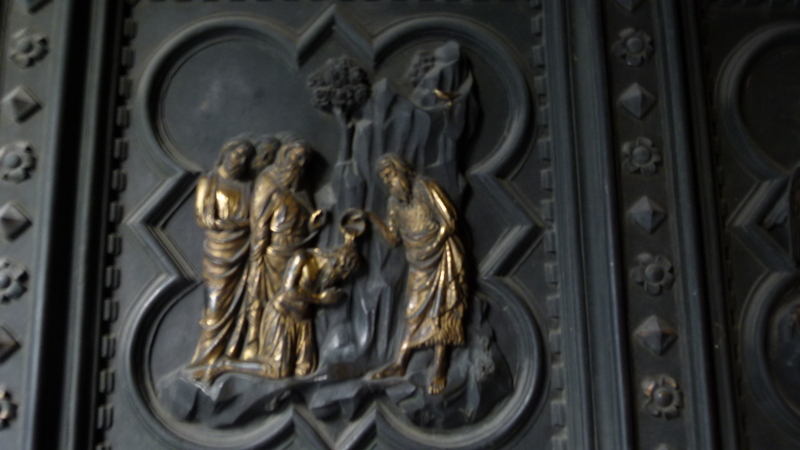 The Gothic bronze portal of Andrea Pisano was added around 1330. This is one of the tiles showing the baptization of the people. For the other, the Renaissance portal there was a competition. 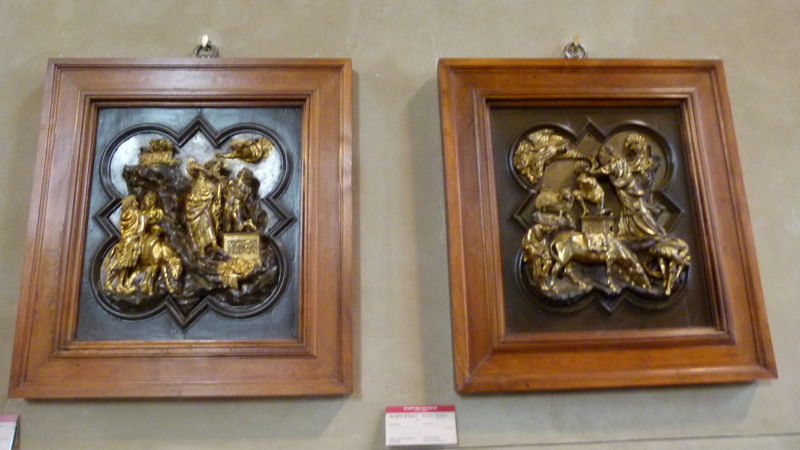 The Bargello museum shows the works of Isaac’s sacrifice that Ghiberti (left) and Brunelleschi (right) had handed in. Ghiberti won the competition. Well, Bruneschelli had a lot more opportunities to embellish his town! Inside the Baptisterium we could not stop looking at the mosaics in the cupola. The new Dumont has a detailed map of all the mosaics. We sat on the benches and studied the life of St. John in the first line (from being announced – and his father Zacharias could not believe that his wife will give birth to a child) until his dramatic death (decapitated in the palace of Herodes). Then we followed the life of Jesus laid out in the second row, from being announced to his resurrection. An interesting detail here: After having adored the child, the three kings leave by boat. I asked myself, where their camels went, as I have always imagined them traveling with camels. 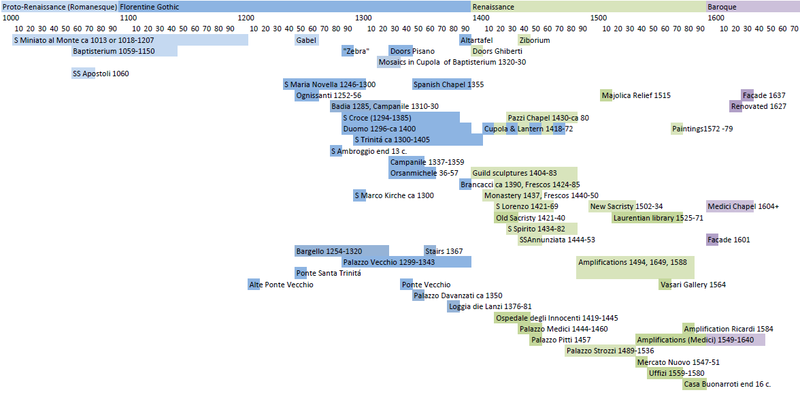 In my next blogs I will continue along that architecture timeline presented at the start. Florence has always made me dream, in particular the Uffizi – one of the greatest museums in Europe. 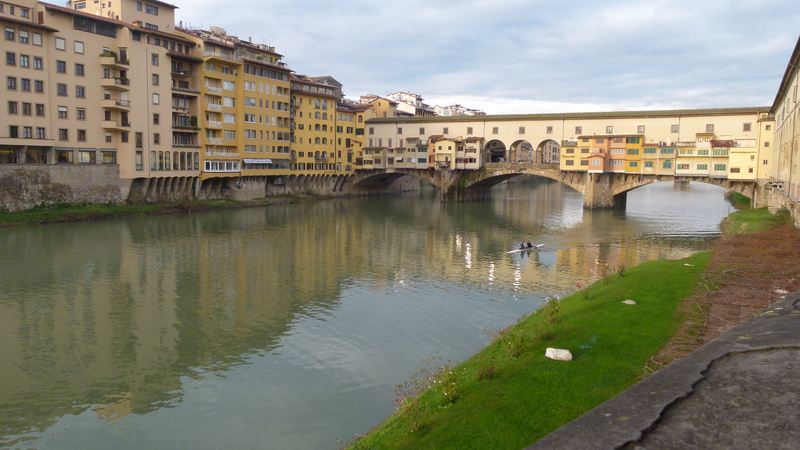 Then the Ponte Vecchio has always impressed me – topped with houses and crossing the Arno. I knew about three Renaissance artists that worked in Florence – Leonardo da Vinci, Michelangelo and Raffael. I knew that Catharina de Medici had married the French king Henry II and later, Maria married Henry IV – they became the grand-parents of Louis XIV. 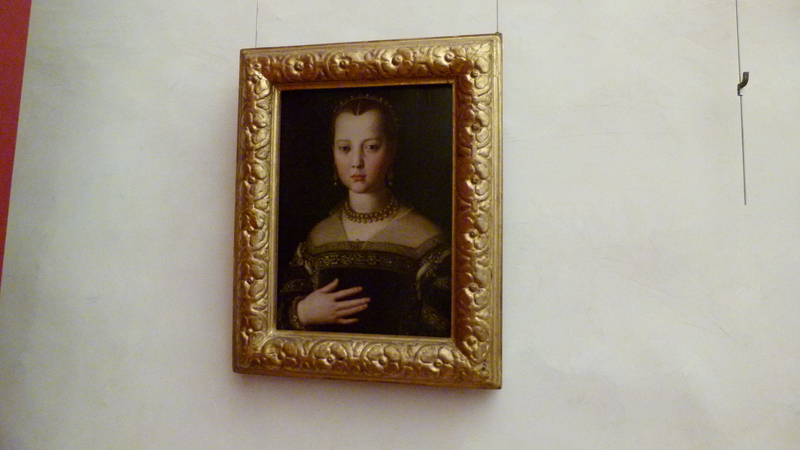 Here is a painting showing Maria (Uffizi). Obviously, Florence played an important role in European history. Yes, it was an old dream of mine to visit Florence. But I have never made it there so far. Ursula has spent many weeks in Florence before. I had told her about my dream. Now she makes it come true: For December 2014 she organizes a trip to Florence for her, for me and for her mum. Zurich – Milano using the Swiss Railway SBB and Milano – Florence in the high speed train Frecciarossa. She reserves rooms in the hotel Minerva at Piazza Santa Maria Novella, close to the main railway station. When we are about to leave for Florence, I hear news about “scioperi”. The Italian railways on strike? No problem for us. SBB takes us to Milano without hesitating. And Frecciarossa is a private railway organization that does not participate in the strikes. We arrive in Florence on time, more precisely than on “normal” days, when our trains would have competed for track capacity with the public trains. After having arrived in Florence, we reach our hotel within five minutes. 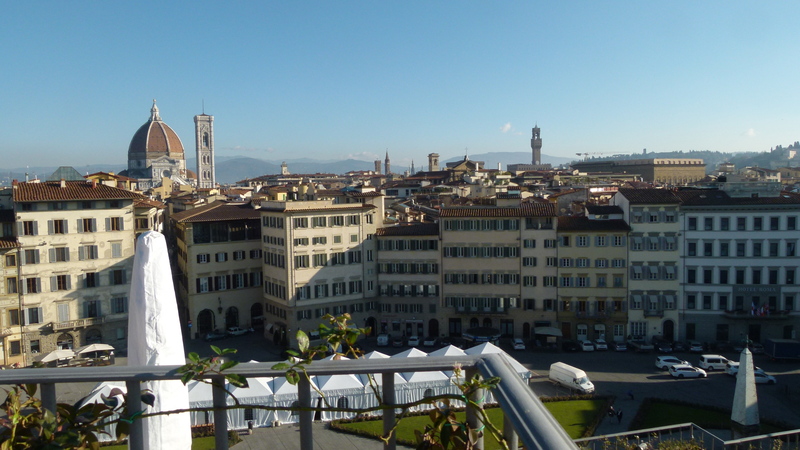 Here is the view from the roof of our hotel to the Dome with the Campanile and Palazzo Vecchio. 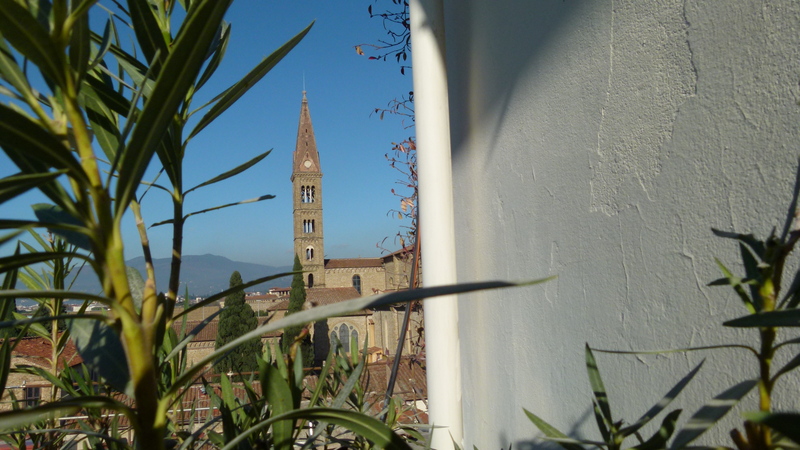 And this is view of the tower of Santa Maria Novella taken from one of the balconies – we are close. When we leave the front door of the hotel we stand in front of the renaissance facade of Santa Maria Novella. Ursula enthusiastically tells me about San Lorenzo, the Baptisterium, the Palazzo Vecchio, Santa Croce, San Miniate al Monte, the Palazzo Pitti and… and… I feel overwhelmed. There is much, much more to be seen than just the Uffizi and the Ponte Vecchio. I hear that sometimes tourists end up in the emergency department of the local hospital, and the diagnosis is “overload with culture” – it is said to be a well-known phenomenon. I believe, if it is not true, it is well invented (or in Italian: si non è vero, è ben trovato). I try to get some order into my head and draw a simplified map of the town with their places of interest. Except Fiesole, they are all within walking distance. The center of medieval Florence is the area around the Dome square (with the Dome, the Baptisterium and the Campanile). The Roman Decumanus and the Cardo can still be noticed in the rectangular street pattern (they cross at today’s Piazza della Repubblica). Grouped in the center are the Palazzo Vecchio (the old townhall in Piazza della Signoria), the Bargello Palace (formerly the residence of the “Bargello”, the head of the police), Badia (a monastery, Brothers of Jerusalem), Orsanmichele (the center and curch of the trade- and craft guilds) and the Uffizi (the administrative center of the dukes of Medici, now THE museum). The center ends with Ponte Vecchio that connects to “Oltrarno” (the area “beyond” the Arno). To the west/north west are Santa Maria Novella (belonging to the Dominicans), San Lorenzo (where the Medici dukes are buried), the nearby Mercato Centrale and the Palace of Medici-Ricasoli (with the chapel hosting gorgeous frescos of the kings traveling to adore Jesus). To the north there are the monastery of San Marco (each cell decorated with a fresco), the Accademia (highlight: David by Michelangelo) and the Ospedale degli Innocenti (forming the harmony of Piazza SS Annunziata with the namesake church). On a hill farther away to the north, the town of Fiesole can be reached using bus number 7 (archaeological center with Roman ruins). 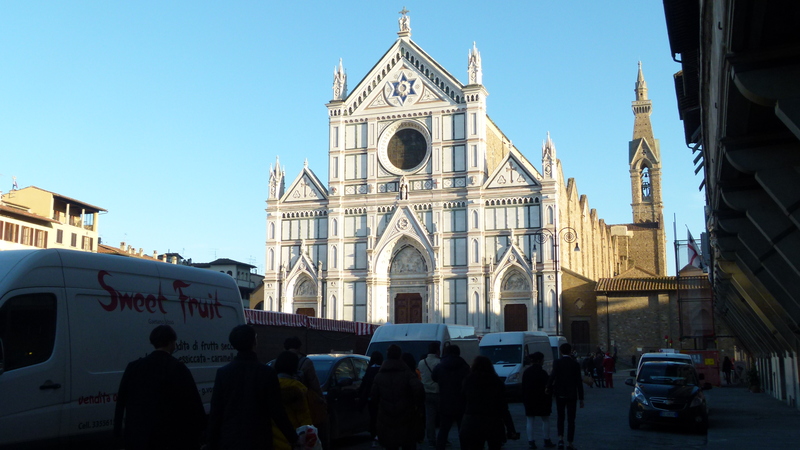 To the east we find the beautiful church Santa Croce and – still farther more to the east – Sant’Ambrogio with its markets. Beyond (or south of) the Arno (Oltrarno) is Santo Spirito (the small streets are the scene of Magdalen Nabb’s detective stories). Nearby is Santa Maria del Carmine with the Branccacci chapel (highlight: the fresco “expulsion from the paradise”). The Palazzo Pitti was home of the dukes of Medici (“hidden” in the Gallery they walked to the Uffizi, sometimes stopping by behind Santa Felicitá to attend the service; today the Palazzo is another art museum). Behind the Palazzo Pitti are the Boboli gardens (climbing uphill) and the Bardini gardens (with a wonderful view of the city). San Miniato al Monte on top of another hill is the oldest church in Florence (church and monastery belong to the Benedictines). These are the cultural highlights that we visited. We also spent wonderful hours eating in exellent and friendly restaurants, shopping in the markets or leather -, dress -, gem – and book stores (Florence is famous for its design culture) or just enjoying the atmosphere in the small streets where each individual house/palace has a story to tell (such as Palazzo Strozzi, Davanzati or Antinori). 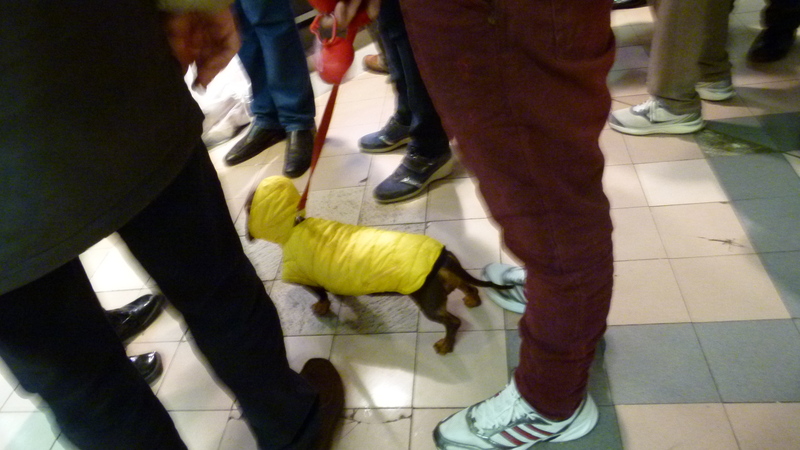 It is good to be in Florence in December: There are less tourists now and the temperatures seem moderate to us (15 degrees during the day) – even if some dog owners would not agree, as this snapshot taken hastily illustrates. 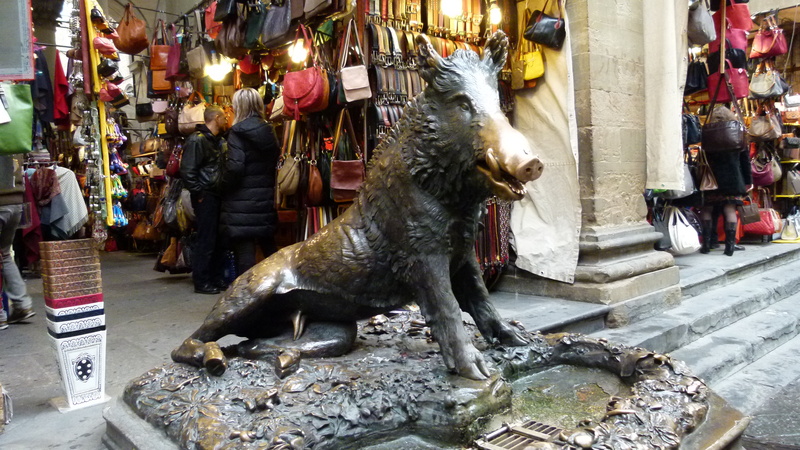 The shining nose of the Porcellino indicates that most tourists want to come back to Florence. I feel the same – After having spent a week here, I would like to come back. However, I do not touch this nose that so many people have touched before. Various information sources on the Internet, in particular the useful official website of the museums in Florence. Thank you, Ursula, for organizing and guiding us and thank you, Leni, for the great company. It was good to travel with you, as all three of us loved to stop, watch and take our time to think and digest, when visiting the churches and museums of Florence. And we all enjoyed to do shopping and recover in comfy coffee houses or restaurants. I want to pick out some memories and think about the history of Florence that played an important part in the European history.